KAMPALA – Representatives from the Army, Police and Prisons across six East Africa partner states (Burundi, Kenya, Rwanda, South Sudan, Tanzania and Uganda) are holding a six-day meeting at Silver Springs Hotel in Kampala preparing for a Command Post Exercise (CPX) to be held in Uganda in November 2019. 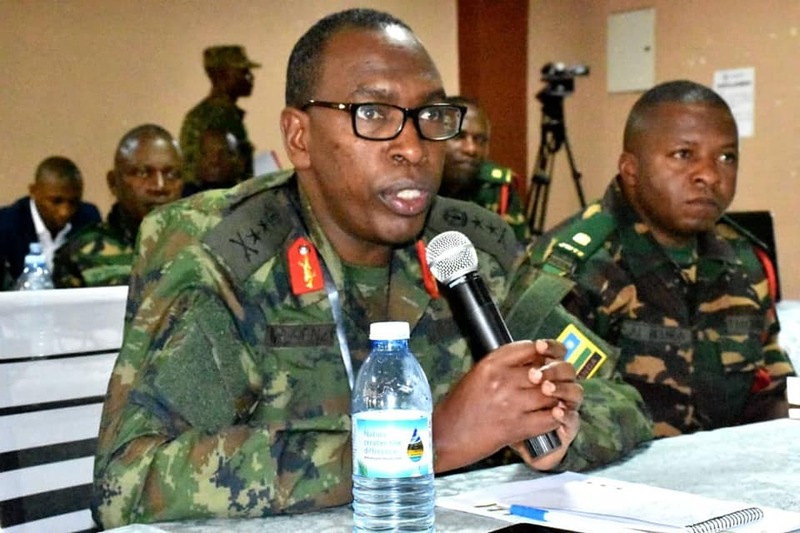 Major General Jean Jacques Mupenzi from the Republic of Rwanda, who is chairing the meeting, said that CPX is a joint security exercise aimed at enhancing interoperability and building capacity of the East Africa forces and partner agencies in handling the region’s security challenges as a single block. “This exercise will widen and deepen our integration we look forward to building a single force capable of planning and executing our mission together for the betterment of our region,” said Gen Mupenzi. He added that the East African region is facing security challenges and natural calamities that can be better addressed through concerted efforts by the region’s forces and other supporting agencies such as non-governmental organizations, hence the need to unite. The joint meeting will review the exercise plan that was drawn in a concept development conference held in Arusha – Tanzania. This year’s EAC Armed Forces CPX will be the 12th edition and is code named USHIRIKIANO IMARA 2019, and will focus on security challenges, peace support operations, disaster management, counter terrorism, and enhancing the state of readiness of EAC partner states in combating complex security challenges in the region among others. The visiting delegations thanked the Uganda Government and the UPDF for the warm welcome and hospitality extended to them. The command post exercise involves military and civil components, and its one of the joint activities by EAC Armed Forces aimed at enhancing the region cooperation in defence that are held on rotational basis among the member states, other activities include Field Training Exercises (FTX) and games. All EAC countries are represented with Burundi led by Colonel Gerald Nikunzi, Kenya by Colonel JB Ngera, Rwanda by Major General Jean Jacques Mupenzi, Tanzania by Brigadier General Marianus Mhangama, South Sudan by Brigadier General Nhiel Arou and Uganda by Major General Sam Okiding.